Researchers funded by the National Institute of Biomedical Imaging and Bioengineering (NIBIB) have developed a way to automatically label images of individual vertebrae during spine surgery, preventing mistakes and saving surgeons both time and stress in the operating room. New work recently published by the team demonstrates the accuracy, feasibility, and advantages of having the technology in the operating room. 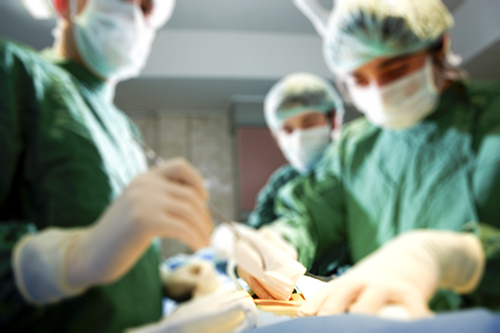 Spine surgery requires careful assurance that surgeons are operating at the right level of the spine. But, because of obesity, low bone density, or anatomical abnormalities, the spine—twenty-four separated vertebrae, the sacrum, and the tailbone—can be difficult to distinguish and number. Both time and money are spent ensuring operations are performed at the right locations; sometimes an extra procedure is done before surgery to label the target vertebra. Still, in about one out of 3,000 procedures, a mistake is made and the wrong level is operated on, causing unnecessary damage and requiring an additional, corrective surgery. To reduce both the chance of error and the burden on the surgeons, a team from Johns Hopkins University and Siemens Healthcare in Germany have developed an algorithm dubbed “LevelCheck” to help identify and label vertebrae in real-time during surgery. “It’s more than just avoiding those one in 3,000 cases. It actually provides assurance to the surgeon, so it means they can be more confident. It just makes for a better procedure,” says Steven Krosnick, M.D., director of the NIBIB program in Image-Guided Interventions. It fits into the surgical workflow and doesn’t require much additional time during surgery, he says. LevelCheck provides orthopedic surgeons with a labeled reference image during spine surgery based on 2-D and 3-D imaging. Source: Siewerdsen Lab, Johns Hopkins University. The researchers first described the algorithm in 2012. It takes advantage of two types of routinely taken images: a computerized tomography (CT) scan taken prior to surgery and a radiograph taken at the beginning of surgery. The CT is three-dimensional, more detailed than a radiograph, and can be used to accurately define and label the vertebrae. When surgery is set to begin, LevelCheck compares the current radiograph to the previously labeled CT, matches positions and landmarks, and projects the labels onto the radiograph. Using high-speed computing, the algorithm makes its comparison and provides labels in the span of 20 to 40 seconds. In the new work, published in the Oct. 15, 2016, issue of the journal Spine, the researchers examined the usefulness of the LevelCheck algorithm by applying it to nearly 400 images previously taken from spinal surgery patients. Three spine surgeons evaluated both the algorithm’s accuracy and how useful they thought such a tool would be during surgery. LevelCheck labeled the vertebrae correctly in every case and the surgeons judged it to be helpful in 42 percent of the cases and to improve confidence in 31 percent. The algorithm was particularly advantageous when anatomical landmarks usually used to count spine segments, such as the sacrum or twelfth rib, were missing, obscured, or abnormal; when spine segments were not easily distinguishable; and when the image quality of the radiographs was poor. As for the additional time spent waiting for the labels to appear, the surgeons said they’d be willing to wait up to a minute for the extra assurance. The team has also designed a version that can be used when only preoperative MRIs, rather than CT scans, are available. Siewerdsen also sees potential for the technology to track and guide devices during surgery and to provide easier ways to collect quantitative data about surgeries. The current work is retrospective—the researchers added the labels to images after surgery. Clinical trials that use the technology during operations are now underway. Still, Siewerdsen thinks LevelCheck could one day be commonplace in the operating room, installed into imaging systems so labels—and the precision and confidence they provide—are just a button push away. The research was funded in part by NIBIB grant EB017226. Utility of the LevelCheck Algorithm for Decision Support in Vertebral Localization. De Silva T, Lo SL, Aygun N, Aghion DM, Boah A, Petteys R, Uneri A, Ketcha MD, Yi T, Vogt S, Kleinszig G, Wei W, Weiten M, Ye X, Bydon A, Sciubba DM, Witham TF, Wolinsky JP, Siewerdsen JH. Spine (Phila Pa 1976). 2016 Oct 15.